Should be on their website late December according to Chandos. Do we know if this is a single release or part of a cycle??? Single release as far as I know. If it says 'Volume 1' that would be a nice surprise for admirers of Lyatoshinsky. I think it is part of a series with Kirill Karabits conducting the Bournemouth Symphony Orchestra in selected works from the Soviet Union. At least, this is what the notes for their Karayev disc suggest: "This set of idiomatically lyrical, rhythmic, and colourful interpretations by the Bournemouth Symphony Orchestra and its Chief Conductor, Kirill Karabits, who appears on Chandos for the first time, marks the start of a new series dedicated to lesser-known composers from former Soviet Union countries." Hmmh, it seems to me Lyatoshinsky is already served by a number of CD recordings of reasonable quality. A pity they hadn't more sense of adventure here, there are so many other Soviet composers queuing up to have more modern recordings of orchestral music... Peiko, Bunin, Abeliovich, Galynin, Eshpai, Nikolayev, Basner, Levitin, Frid, Petrov, Tishchenko, Slonimsky would be on my list. "Sense of adventure" = "No sales". That's a great list, Robert. This will be epic! Instabuy. I agree - I already have pre-ordered it in an obsessive-compulsive frenzy! 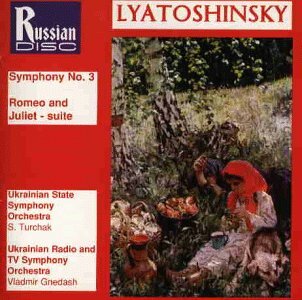 Am thrilled with the new CD of Lyatoshynsky's Third Symphony and Grazhyna. Although early in January I'm sure this will be one of my discs of the year. Furthermore the symphony includes the original last movement before Lyatoshynsky was pressurised into revising it. It has a wonderful 'pealing bells' conclusion. The recording is excellent allowing us to hear far more detail of the orchestration. The inclusion of Grazhyna, which some consider the composer's finest work, is the icing on the cake. A wonderful disc! Let's be analytical (rather than emotional) about this decision. To start with, estimate for me when you last listened to one (or more) of that Marco Polo set?